As some of you may or may not know, I have decided to take some time off to recharge and relax. As part of this time off, I decided to take the Circle Line tour yesterday. 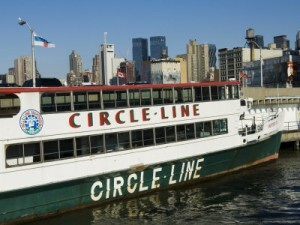 For those of you that aren’t familiar, the Circle Line is a sightseeing company that runs boat tours in NYC. There are several different tour types and lengths that the company offers, and I chose to go on the 3 hour full island sight seeing cruise. Yes, I went on the 3 hour tour, 3 hour tour (don’t worry I made it back in one piece). Besides the fact that Manhattan and the surrounding boroughs are full of history and are intriguing to look at and take in, the tour was an awesome experience! One of the things that made the tour so great was the tour announcer. This man knew his NYC history. But not only that, his information set crowd expectations as well as answered questions before they were asked. The announcer knew, probably from both experience and research, what the crowds would want to hear about (for instance showing us where flight 1549 touched down and explaining how it was a successful rescue). The announcer basically knew his audience, knew the things they would want to know about, knew the questions they would have, and knew how to direct them throughout his experience. This guy was a UX pro if I’ve ever seen one. I would highly recommend the Circle Line for both locals and tourists, and plan on going again one day. Maybe next time I’ll ask the announcer for some great UX tips!! It was well worth the $35 for the full tour… I loved it! Cool! I’ve always wanted to do the Circle Line. Nice! Thanks Phil, sounds like the ferry is next on my list! Neat recommendation! I often tell people to take the Staten Island Ferry. It’s free, and you can a great view of the statue of liberty and downtown skyline. Plus they serve beer on the ferry. Neat recommendation! nI often tell people to take the Staten Island Ferry. It’s free, and you can a great view of the statue of liberty and downtown skyline. Plus they serve beer on the ferry.